Filius Jere, retired former radio broadcaster, decided to translate the Beyond Today programs in hopes of putting them on the radio in his town of Chipata, Zambia on the far east of Zambia near the border of Malawi and uses his own tithe money to put the show on the air. Filius Jere speaking and Nawa Talama sitting. Early in November, Zambian elder Major Nawa Talama was interviewed and answered questions on a talk show hosted by Filius Jere. Together, elders Derrick Pringle and Nawa Talama went to visit this developing area in the far east of Zambia. This visit was a follow up made because of increased interest in UCG’s Beyond Today program that had been airing in the local language for over a year. The broadcasting station is called Feel Free and has a 200 kilometer radius, reaching approximately 800,000 people in both Zambia and Malawi. Filius Jere, retired former radio broadcaster, decided to translate the Beyond Today programs in hopes of putting them on the radio in his town of Chipata, Zambia on the far east of Zambia near the border of Malawi. As a recently ordained deacon by Nawa Talama during the 2015 Lusaka Feast of Tabernacles, Filius had interviewed me at the Feast in 2014 for his radio program. He had asked if he could use his own tithes to put the programs on his radio program and because of the low cost of the program was given the green light to test the market. Mr. Talama’s interview, done from a small studio in Chipata, went extremely well, with good answers to follow-up questions that came in. There is a large presence of Seventh-day Adventists in Zambia, with a large contingent in this area. Derrick Pringle stated, “This visit came at the right time and it was gratifying to experience the eagerness and interest that the people, mostly new, showed in wanting to know the truth and what the Church is all about.” Mr. Talama had only recently recovered from a major bout of malaria. 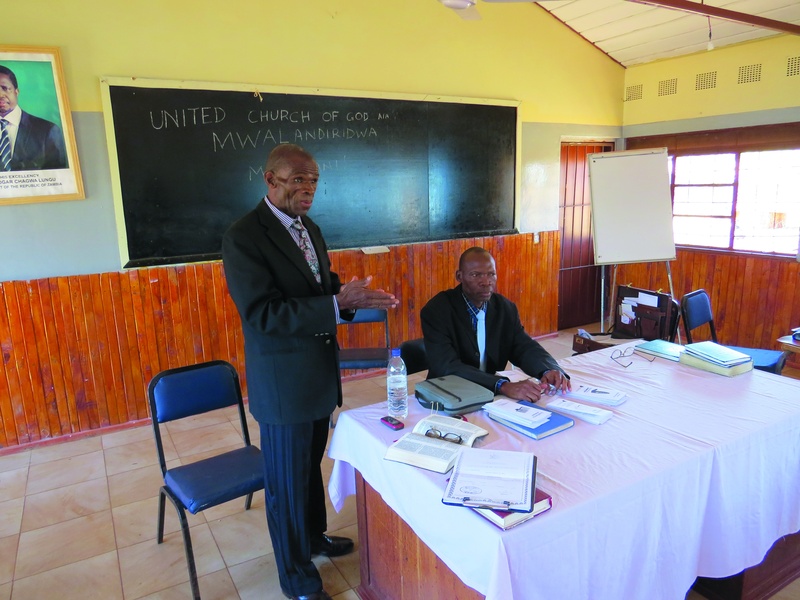 With this visit, Mr. Pringle and Mr. Talama were able to establish a new branch of the Church in the far east of Zambia, leaving a copy of the Certificate of Registration of UCG with the deacon Filius Jere should any questions arise from local authorities about the legitimacy of UCG. In the short time since the interview program, Mr. Jere has informed us that two Pentecostal pastors have resigned and are advocating UCG. Also a Muslim has decided the gospel message made sense and is changing religion. Please pray for the safety of those choosing such a different path. Mr. Jere, with his deep, resonating voice, served the station for a number of years before retiring and remains in an agricultural advisory capacity with them. He now helps explain the doctrines of UCG in their vernacular. He downloads Beyond Today and also broadcasts them in the local language. The studio has now asked us for this to be also done in English. A half hour costs Zambian kwatcha 357 ($28). Mr. Pringle tried negotiating, but they would not come down in price but offered an additional 10 minutes. Twice a month Mr. Jere travels to outlying areas using his own resources to visit people concerning the Church. We are examining the budget to see if we can help him in his service and with the broadcast. Along with his zeal for God’s Word, Mr. Jere has an agricultural technique allowing production of up to three times more maize per acre than normal. Through him Mr. Pringle and Mr. Talama hope to select a farmer from Mufulira, Solwezi and Mufumbwe to send to him for training in his methods in January in conjunction with Good Works or LifeNets. Should this come about, in about April or May Mr. Jere will visit these farmers to monitor their progress. Mr. Talama is looking for appropriate farmers from his areas who would be willing to change from their traditional farming methods.